Universal is set to release a special download package of Music of the Spheres on iTunes on March 18th. 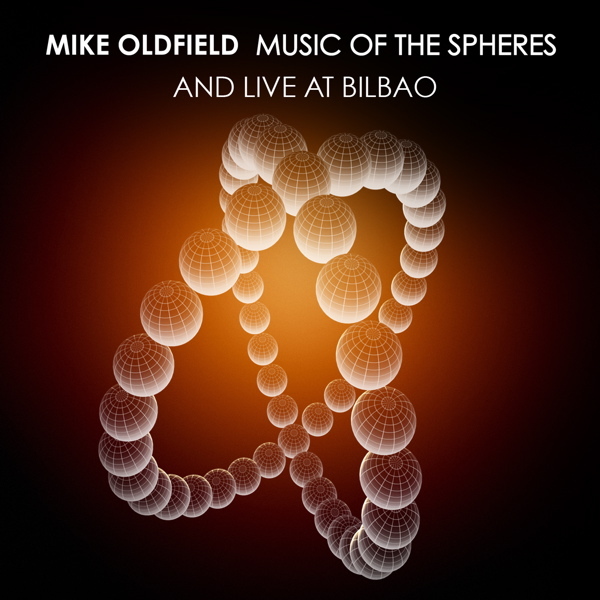 The release includes the studio recording, modified artwork, a video interview with Mike Oldfield and Karl Jenkins, the live recording of the premiere concert in Bilbao and a PDF booklet. I just edited it to make it a bit clearer that it's a download-edition rather than a CD - sorry for the confusion. Arghhh - does this mean that I'm going to have to buy the standard CD version AND the download version in order to get the live version. They're not dumb these Universal Records people are they? Regarding the Live Premiere Performance @ the Guggenheim Museum, Bilbao...I just hope it's of a reasonable sound quality and the bum note has been edited out. I´m sure it sounded much better than what we heard! What about the prize?? Maybe 10L?? I hope it will include back artwork in order to make an own pack CD. I want a PROPER 2CD release! It all seems a bit Panicky to me.. I think they were caught with there Pants down earlier when the Album was Put out on to the Net... I think theyre probably trying to beat any Boot leg that may be surfacing anytime soon... Stuff like this is normally released after the Main Album has done the Rounds 1st.. i wont be interested anyway as the Studio recording should be miles better anyway.. whats the point of Tidying up a Live recording anyway !! Should be Heard how it was on the Day really mistakes and all.. I doubt they'll be able to do a lot of tidying up - I imagine the sound of the guitar will have bled from the speakers (they were pointed towards the orchestra, I presume in an attempt to diffuse the sound by bouncing it off the back wall, to remove any artificial edge from it...can't say it really worked, but I believe that was the theory behind it! ) into all the orchestra microphones. They might be able to fudge something, it would depend on the specifics. I doubt anyone got the chance to make a bootleg recording. There is a short illicit video on youtube of Mike arriving on stage, which was obviously made from the front row - I thought it was mostly executives from the record company sitting there! Who knows, maybe they were making bootleg recordings too! Well, that "re-edited" artwork is the shabbiest thing ever. The live premiere, the video interview (has mike anything to say yet? ), etc, will be on the Net the very day they are released. Find, listen and decide if you buy or not. So easy. i wont be interested anyway as the Studio recording should be miles better anyway.. whats the point of Tidying up a Live recording anyway !! Should be Heard how it was on the Day really mistakes and all..
Judging by how people are reporting tracks like Harbinger and Musica Universalis being way more powerful than the studio recording sounds to me like the live version of the whole album could be a real winner. Doesn't surprise me at all seeing how Mike has had a tendency since TB2 to over consider his studio recordings until all sense of live spontaneity is overengineered into oblivion. TB3 and the Guitars tracks were way way better as live performances during the 99 tour in my opinion and I don't doubt for a second that MOTS would or could be the same. As for tidying up live performances in post production. A lot of it goes on . Apparently Peter Gabriel re-sung a lot of his vocal parts in the studio for his Secret World live recording in 1993. Does it defeat the point of it being a 'live' recording? I'm not sure it does. Personally as a listener I like live recordings more to appreciate how tracks are re-arranged for live performances, listening to new bits and pieces that are added to give live versions of tracks a distinction from their studio recording. I remember Mike saying after the TB2 premier in concert in Edinburgh that he loved it because he likes live performances that are as close to the original recording as possible and I just thought thats exactly what I disliked about the Edinburgh concert - it was just far to similar to the studio recording, it was as good as a note for note reproduction. I much prefer it when Mike add libs a bit during a performance with his brilliant guitar playing. So its for that reason that I was really looking forward to hearing the live version of MOTS having heard and loved the album. I thought Mike would really add a bit of color to his parts on the live performance with a bit of acoustic add libbing. Its a shame people are reporting he froze up a bit on the night. Could anyone explain to me how does itunes work? Have I to download it and then burn it on a CD-R? and print the booklet? Could I listen to it in my CD player? Yeah you could do all that and make you're own CD album of it. Just remember its source is an mp3 file though so even at the highest bit rate its still way inferior to a good audio CD which is why so many people who still take their music listening seriously (us lot in other words) hate the mp3 culture. The upside however is that it does make it easier and cheaper to make official recordings like the MOTS concert available. A few years ago a concert recording like this one would probably just have sat on someones (probably Mike's) shelf. I remember Mike saying after the TB2 premier in concert in Edinburgh that he loved it because he likes live performances that are as close to the original recording as possible and I just thought thats exactly what I disliked about the Edinburgh concert - it was just far to similar to the studio recording, it was as good as a note for note reproduction. I much prefer it when Mike add libs a bit during a performance with his brilliant guitar playing. I totally agree with this Toby. The BBC2 "later" version of Far Above the Clouds from TB3 was outstanding. Mike let the guitar have a bit more prominence and live, it really worked. Hope that the live recording can be released as a real CD one day! According to Dark Star,the videos featured on this release are from the MOTS EPK. I guess so. Yesterday I could finally buy the Spheres single in the Swedish iTunes Store. My guess is that you can buy this in any store, you just have to wait a few days more than UK inhabitans.